Speer ammunition since 1943, has delivered some of the most trusted ammunition ever produced. Initially designing hunting ammunition, Speer has since grown into one of the most trusted rounds for law enforcement and the civilian market. From their American based manufacturing plant in Idaho, they continue to develop dependable, quality ammunition for a variety of uses. 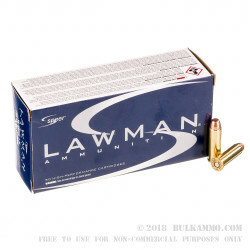 Lawman training ammunition from Speer gets you as close as possible to practice with self-defense loads. All Lawman ammunition comes with a total metal jacket projectile, which—unlike a full metal jacket—contains the entire core inside of a plated jacket. 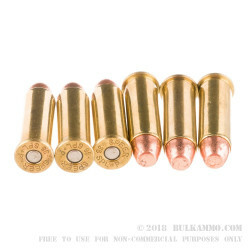 These Speer .38 Special +P rounds come equipped with 158-grain TMJ projectile, loaded into CCI boxer-primed, noncorrosive, reloadable brass cases and are capable of a muzzle velocity of 900 FPS. 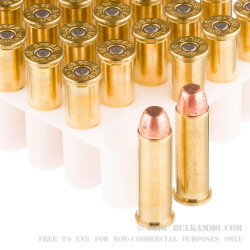 These rounds also come with clean-fire loads, reducing the amount of heavy metals released in the air while shooting due to the TMJ projectile, while clean fire primers are leadless. Spent shell casings look almost unfired inside making these an ideal round for an indoor range where ventilation may be poor. 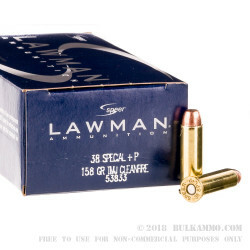 Each box of Speer Lawman .38 Special +P from Speer comes with 50 rounds and are great for your next range or plinking day.